The source code for this and the other parts of this series is available on Github. 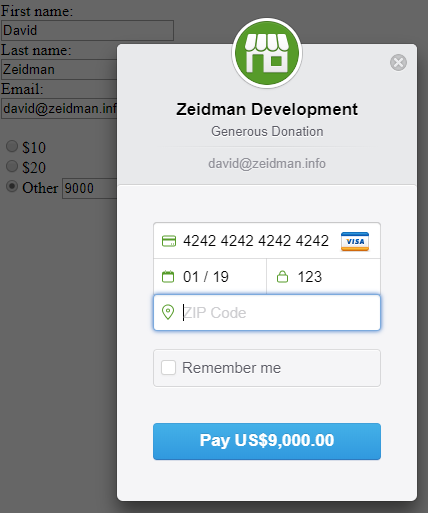 Now we are going to focus on the web page that captures the donation. We are going to show the minimum here. You will want to include data validation to ensure that the incoming data is valid. You will also want some form of security to ensure that you don’t end up sending a lot of spam into your Raiser’s Edge. // You can access the token ID with `token.id`. // Get the token ID to your server-side code for use. Then we have our form tag which displays the fields we use to capture the data. 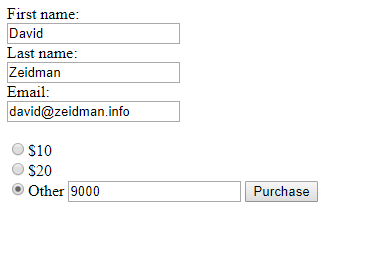 In this case we are capturing a first name, last name, email address and a donation amount. Of course you may want to capture other fields too. We also have a hidden field that will store the token that Stripe generates once it has captured the credit card details. It is with this token that Stripe will actually take payment. That way we are not transmitting any actual credit card details over the internet. In this example, the token is relatively short lived so do not attempt to save the value as you will not be able to reuse it after a few minutes. There is also a payment button. Finally we have the Stripe initialisation code, the code that captures the button click in order to show the credit card capture form and finally the code that shuts that form down should we navigate away from the page. In the next part we look at how we handle the incoming data on the server.